Sometimes it pays to throw caution to the wind and go big in your design choices. We know that committing to a bold look in the kitchen might push you outside of your comfort zone, but the results can be visually stunning. There really aren't any rules when it comes to eclectic kitchen designs, so feel free to mix and match with colors and patterns. Need some ideas? These 13 photos are the perfect place to start gathering inspiration. 1. Take on a tropical look. We love Justina Blakeney's use of color and her ability to mix and match patterns in a no-holds-barred kind of way. Her own kitchen is a perfect example. 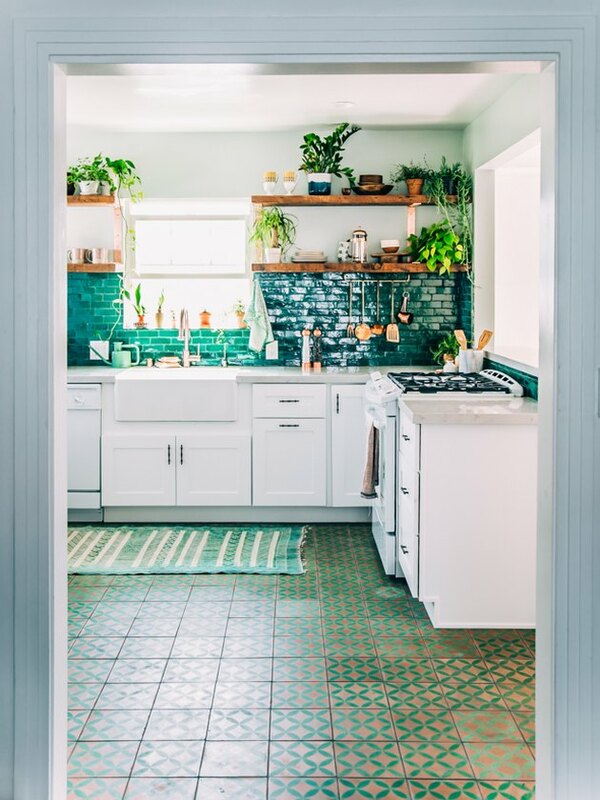 The emerald green backsplash and tiled floor create a tropical vibe that's enhanced by her plentiful plants. 2. Mix pattern and color. 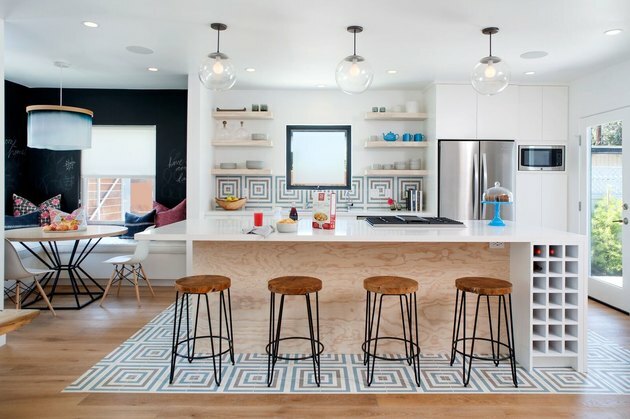 Who wouldn't want to linger in this vibrant kitchen by Studio Life/Style? The high contrast Ann Sacks tile, blue lacquered cabinets, and mixed metal finishes create an energetic, spirited space. The wood floors and beams add warmth and temper the pattern and color. 3. Let your lighting take center stage. Wit and Delight nailed this kitchen makeover for their Studio 125 space. 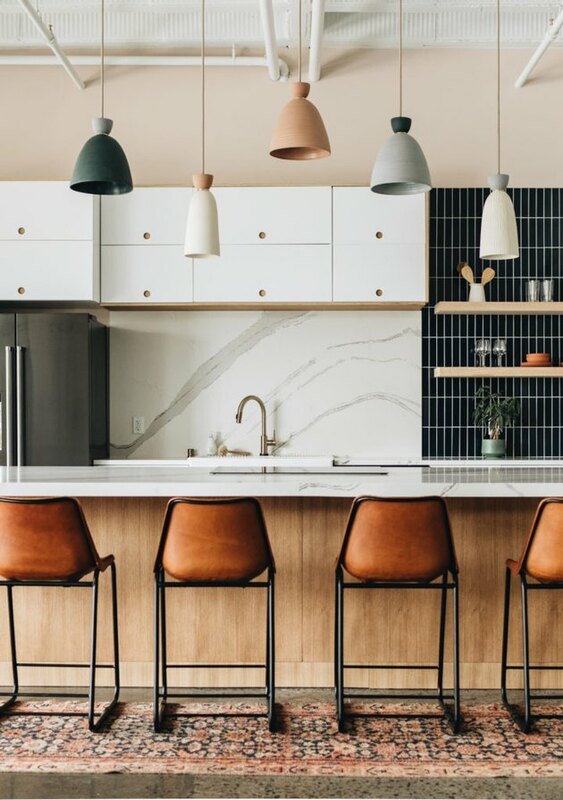 We love the whimsical mix of pendant lights in different colors and lengths. The vertically applied Fireclay tiles, Brittannica Matte Quartz from Cambria, and minimal flat-front cabinetry provide an eye-catching backdrop. 4. Be daring with how you use tile. 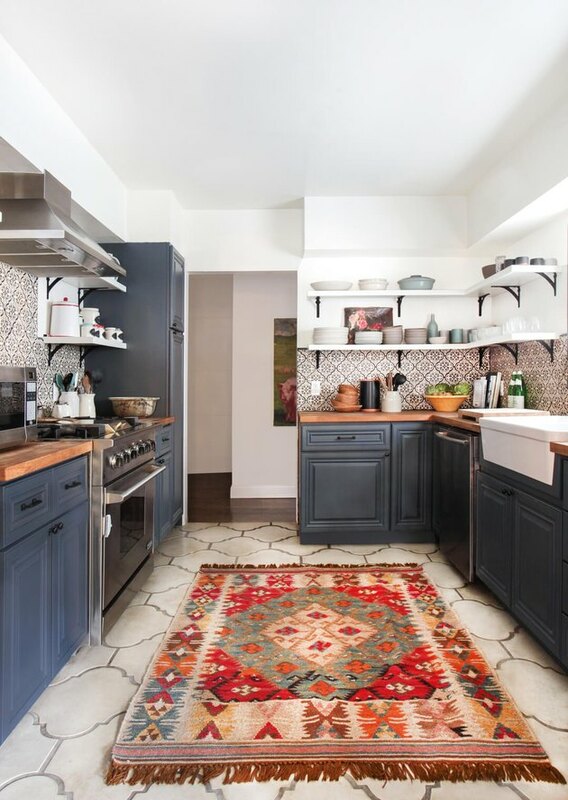 Why not create a tile "carpet" in your kitchen as designer Daleet Spector did for her client? The Clé tiles delineate the kitchen from the dining nook, and serve as a backsplash as well. The square window cleverly echoes the tile shape. Who knew that eclectic could be so glamorous? 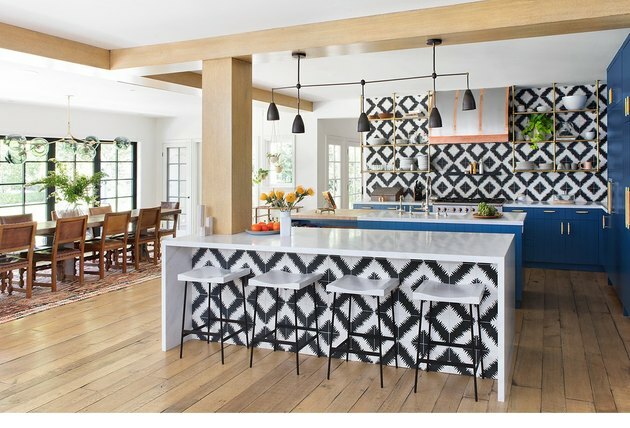 Fortunately Black Lacquer Design got the memo and executed the look perfectly in this Hollywood Hills kitchen. 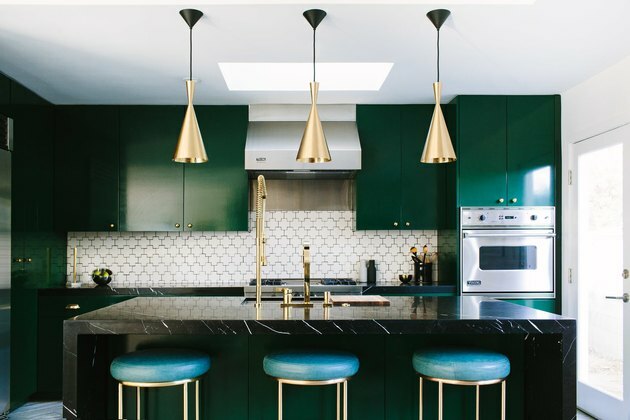 We love how they paired saturated emerald cabinets, black marble countertops, and brass fixtures with an unexpected ceramic, geometric backsplash. 6. Choose a colorful stove. Steven Gambrel is a master of timeless style. 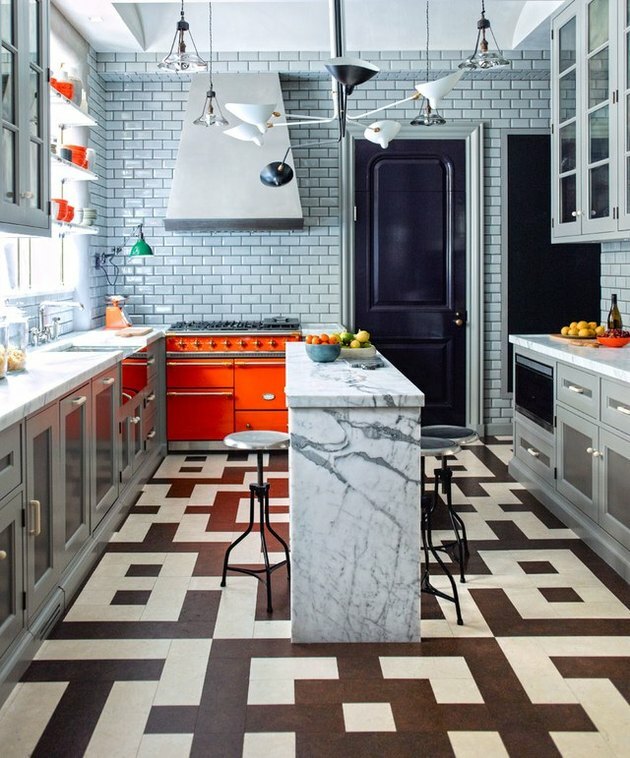 Here he pairs bold geometric flooring with a bright orange stove to infuse personality in this otherwise traditional kitchen. 7. Add an area rug. Use area rugs, as Emily Henderson did in this Spanish-style kitchen, to punch up color in your space. They're easy to swap out if you tire of the look. 8. Let grout stand out. 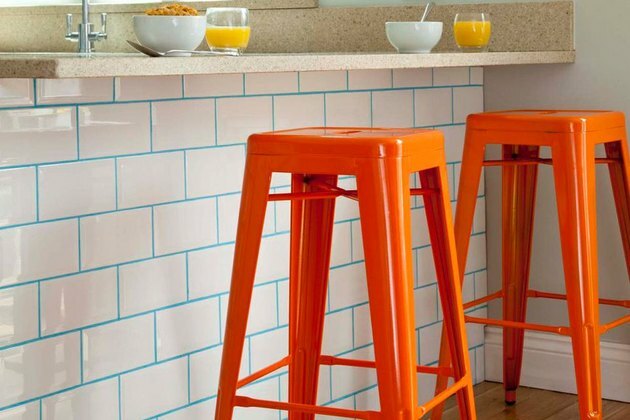 Few things are as polarizing in the design world as colored grout, but if you are looking to create an unexpected and unique statement, this is one to consider. We love how British Ceramic Tile up the artistic ante with its use of complementary colors. 9. Coordinate your cabinets and your stove. Remember the original version of the show Queer Eye for the Straight Guy? (Not to be confused with the re-boot, Queer Eye, which we highly recommend.) Well in case you missed it, Thom Filicia is a bonafide interior designer and has been for years. 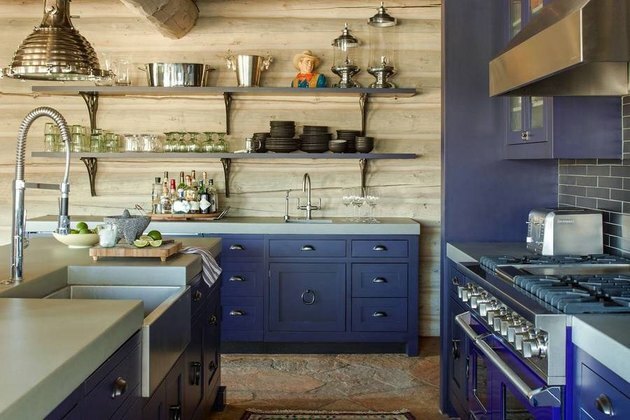 In this mountain retreat kitchen, he matches a cobalt blue stove to the cabinets. And it works, especially when it's tempered by the hand hewn beams, a wood wall, and cement countertops. 10. Create a sense of wonder with wallpaper. 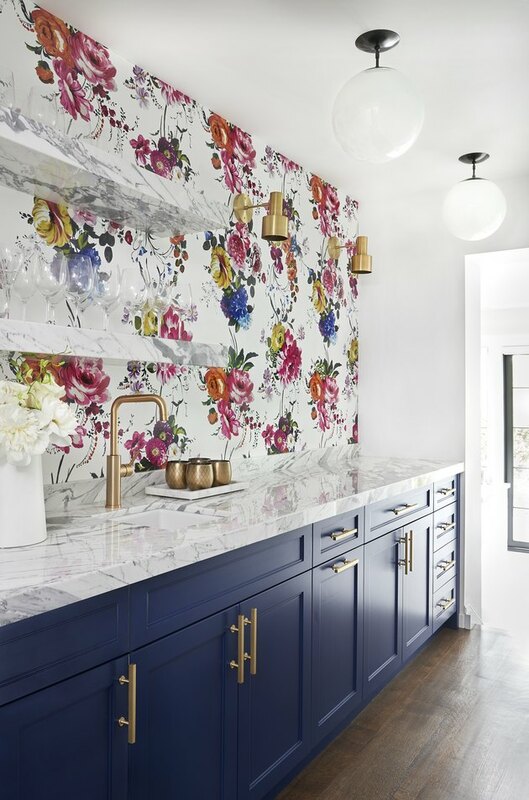 The kitchen isn't typically the first place you'd think of to add wallpaper, but designer Ali Budd knows that it's a great way to make a statement. Tread carefully when deciding where to use this and keep it away from high splash areas like behind the stove. 11. Supersize one item for dramatic effect. 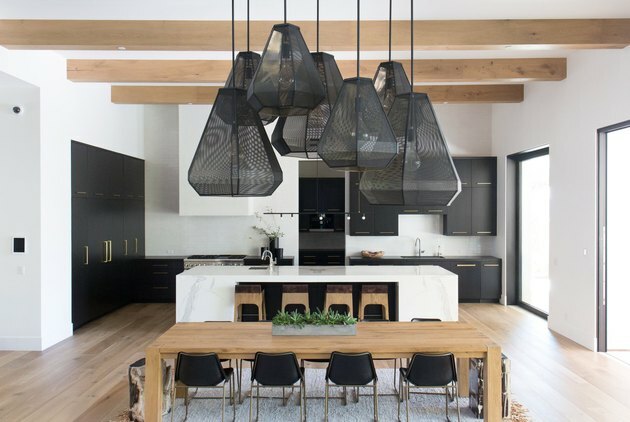 Extra large pendant lights are the only statement-making design element needed in this high-contrast kitchen by RailiCa design. The mix of chairs and stools add interest, as a cream fringe on the rug softens the space.